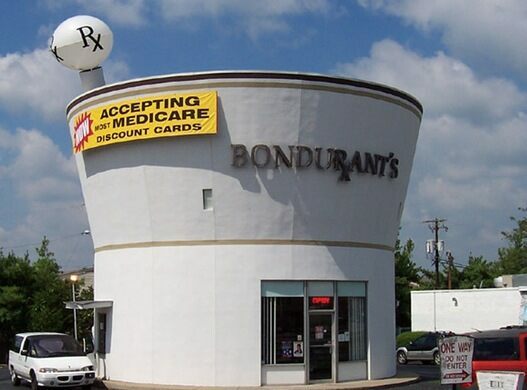 A familiar site to Lexington, KY residents, Bondurant’s Pharmacy has been in operation since 1974. The pharmacy was designed by founder Joe Bondurant, not surprisingly, after a trip to Las Vegas. 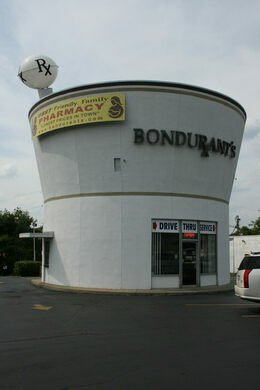 The building is 32 feet in diameter and 30 feet tall, not including the 10 foot tip of the pestle above the roof. The second floor was originally designed as an apartment for the pharmacist. The pharmacy is equipped with two drive-thru windows, one for ordering, another for pick-up, as well as parking spaces for customers. Joe Bondurant operated the pharmacy until 2003, when he sold the building to Eric Brewer who carried the business on until 2011. 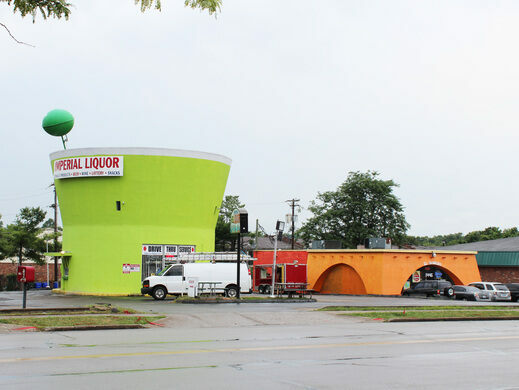 Today, the giant mortar and pestle house a drive-thru liquor store.